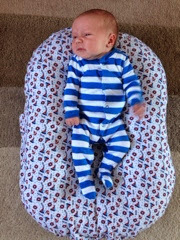 Three weeks into having a new baby and now the sleep deprivation is starting to kick in as hubby is back at work and Bubba has gone back to waking up at around 5.20am (I say around, it's pretty much spot on most mornings). In the small hours I got to thinking about the five things that are making my life easier right now. Seriously I didn't want to go down the dummy route by now we have, I embraced it wholeheartedly and saw these dummies advertised in a magazine. They are normal dummies and the only brilliant thing is that they come in a handy transportable box which doubles up as a steralisers so no more of the worrying 'what if I drop a dummy whilst out' dilema. A lot of shops and restaurants have microwaves you can use and all you do is pop a bit of water in and nuke them for 3 minutes. I love it! I really coveted this bath the first time I saw it but worried it was too expensive for a bath made from polystyrene. Especially seeing as I used a foam bath support at £4 first time around with Bubba. I kept looking at this bath online and read other reviews and then saw it at The Baby Show in Bluewater, again I dithered but didn't buy it. It was only when I got home and couldn't stop thinking about it that I then ordered it. 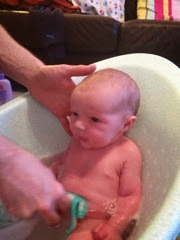 Little man had his first bath in it and he looked so comfortable and it was easy to bath him alone, I can remember first time around with Bubba it was all a bit stressful, she was slippery and I was worried (and didn't have enough hands to support her) I would drop her. This has a bump in the base which accommodates a little bottom perfectly and supports his back really well. Even Bubba has had a go sitting in it, although this isn't recommended! With Bubba I didn't really see much difference from using this and she would continue to scream and have colic. Little man has been using it a week and it's made so much of a difference to him already and where previously I believed it was all a marketing ploy and clearly didn't work, this time I wouldn't be without it. Just goes to show, every baby is different. These are brilliant, I've never been that keen on the normal ones as they are harsh and strongly perfumed but now Johnsons have brought out some extra sensitive wipes designed for newborns. I could never get on with bowls of water and cotton wool approach. These are a godsend in my world, only yesterday I had to clear up and epic nappy disaster which took about 9 wipes to solve (all up his back...need I say more!) Just think how much cotton wool that would have needed! As with the Shnuggle, I wasn't sure I needed this seeing as we didn't have anything like this for Bubba. It's really just a giant cushion made out of memory foam that supports baby. I wanted it to take upstairs or keep cub out the way whilst the toddler was at large. I'm glad we got it and the older he gets, the more use I can see it getting.